energy-efficient illuminators and keep moving with the LED technology. with a lovely square light head, Dusk-to-dawn LED Outdoor Flood Light. ☀ 3400lm ultra-bright yard light, much brighter than most similar products in the market. ☀ Automatically turn on at night and stay off at daytime. Effectively avoid the waste of human and material resources. ☀ The adjustable light head could swing 180° vertically, this will make the lamp suit different needs easily. ☀ 120° wide beam angle, lighting coverage is 88.5' × 88.5' at the mounting height of 20'. ☀ With the stalinite lampshade, the shock resistance is strengthened significantly, no more injuries caused by glass fragments. ☀ A photosensor cover is provided to prevent the sensor from falsely triggering. ☀ IP65 waterproof rating, effectively prevent water from permeating, excellent for outdoor applications, like gardens, court, lawn, patio, etc. voltage instability, with a wider voltage range of AC 110-277V. ☀ Only consumes 28 watt but provides the same brightness as a traditional 220W one do. to avoid flickering according to the user manual. ✅ ACCURATE PHOTO SENSITIVITY - This floodlight automatically turns on at night and stays off at daytime. With the photocell located under the light head, interferences caused by artificial light sources are reduced significantly. 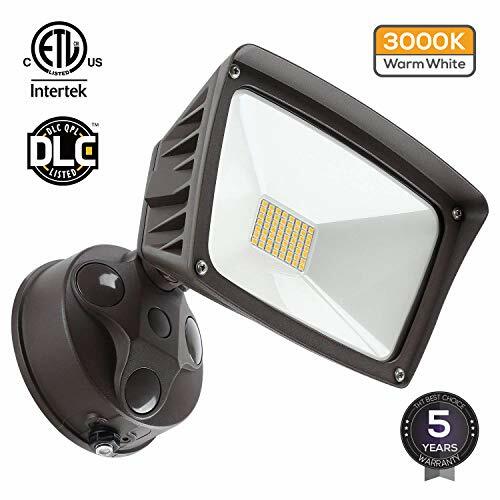 ✅ BETTER WATERPROOF - With IP65 rating and specially designed lens hood which effectively avoids seepage and reduces light pollution, this lamp is not only wet locations available, but also stay sharp even in the rain. ✅ MORE DURABLE - Die-casting aluminum housing and stalinite lampshade both are corrosion and rust resistant, and possess good resistance to moisture and vibration, which also help prolong its service life up to 50000hrs and lead to a almost replacement-free life. ✅ WIDER APPLICATIONS - AC 110-277V available, don't have to change the power line, which makes our lamp a more competitive lighting device for a wide range of applications and cuts down unnecessary wastage caused by voltage instability. ✅ FEWER ELECTRICITY - DLC-certified for premium standards and performance, eligible for state and nation wide rebate programs. ETL listed for quality assurance and safe operation. You can save up to $1056 in electricity bills throughout its lifetime, which is enough to buy several Amazon Echo devices. View More In Outdoor Lighting. If you have any questions about this product by LEONLITE, contact us by completing and submitting the form below. If you are looking for a specif part number, please include it with your message.